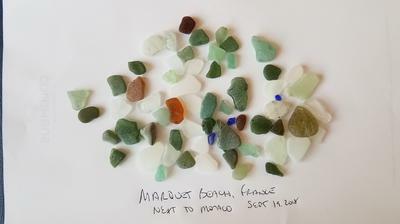 I found about 60 pieces of well tumbled sea glass on Marquet Beach in France, walking distance from Monaco. About half were green, then white, 4 brown and 3 very small cobalt blue pieces. All were gathered in about 20 minutes in front of the restaurant that has the blue chairs and umbrellas. Lunch was good there too!